Last week Trav and I took Arle to see Toy Story at the movie theater. She had been to a movie last Christmas, but didn’t seem to remember the experience. The look on her face was priceless as we walked in and she saw the humongous screen. Me: Do you want a big T.V. like that? Arle: Yes, I do, please. We got settled into our seats and she refused to take her coat and hat off. It was the first really cold day of the season and she was thrilled to be sportin’ her winter gear. 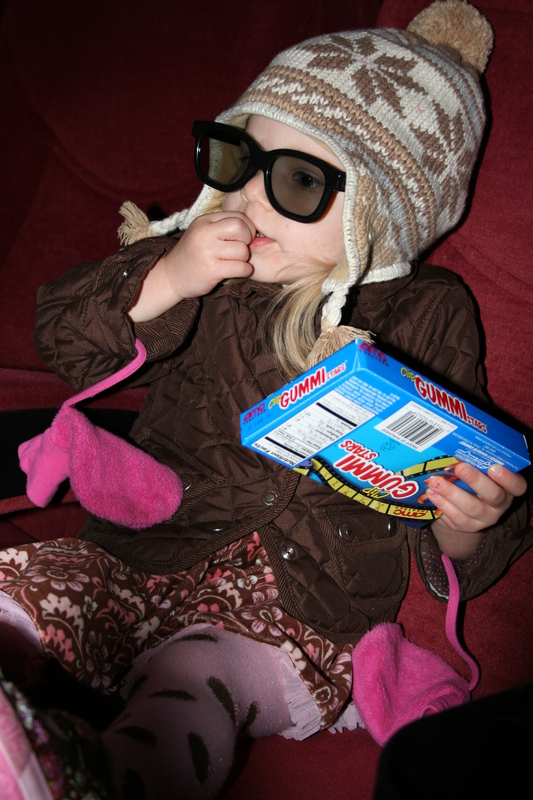 The only reason she took her mittens off was so she could eat her gummy stars. Her 3-D glasses topped off the look nicely, I think. Golly gee! She is too adorable!! She looks like a movie star, incognito, at her own premier!! I wish I could have been there. I am so glad Trav went with you. Usuallly…..NO ALWAYS, when we go to the movie as a family, Cohen and I find Brandon leaving us in the kiddie movie to go watch something else—-GRAND! !